Elsie de Wolfe's Flaming Cherries, halfway to completion. Any recipe involving liquor and a match makes dinner a celebration. One of the easiest desserts involving these two elements is Flaming Cherries from Elsie de Wolfe’s Recipes for Successful Dining. As the ending to an evening meal it is simple, basic, and good, a sophisticated version of nursery food. 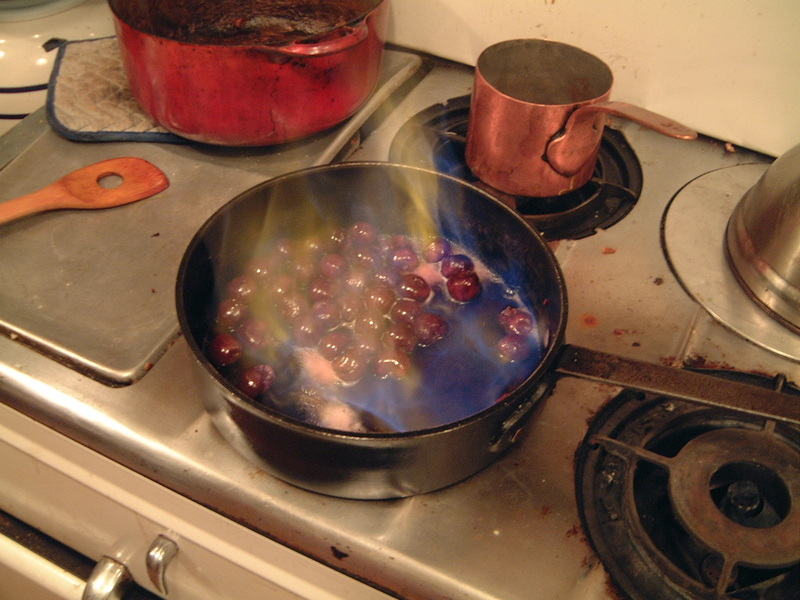 Flaming Cherries, ready to eat. Below is de Wolfe’s recipe. Following that is our seat-of-the-pants adaptation, using E & J brandy (my husband called it “wino quality”), canned Bing cherries, and Nuyens Wisniowka, a cherry cordial we found on the bottom shelf of our bar, hidden so well it had a coating of dust. Feel free to substitute our happenstance ingredients with anything suitable that happens to be hanging around your pantry. Our daughter’s verdict? “I didn’t like the cherries but the cherry sauce with the vanilla ice-cream tasted good.” Oh, and in case anybody’s wondering, her serving of ice cream was topped with three cherries without the cherry-liqueur addition. Take a bottle of very best conserved red cherries and heat well. Add a large wine glass of brandy and set aflame. When flame has died down, add a small glass of Kirsch liqueur. Serve hot with vanilla ice-cream. Heat the cherries in a skillet over a medium-high heat. Add the brandy and carefully light. When the flames subside, add the cherry liqueur. 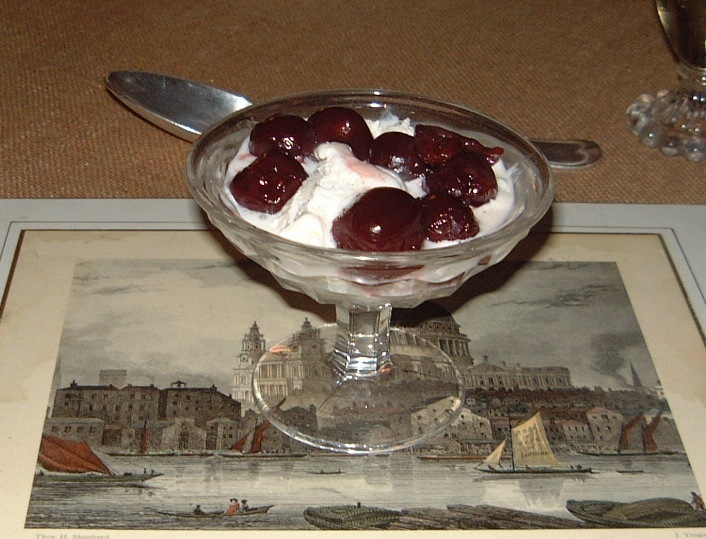 Spoon the hot cherries over ice cream and serve. 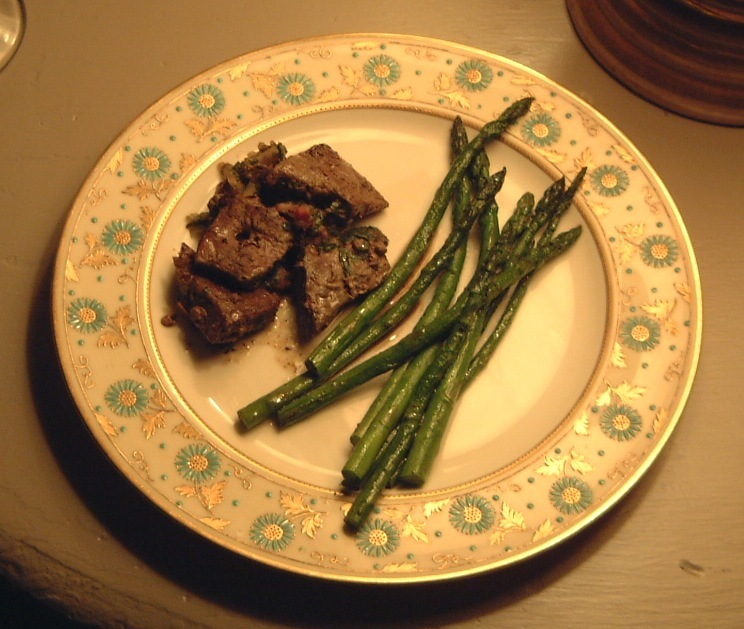 X. Marcel Boulestin's foie de veau, with a side of asparagus. X. Marcel Boulestin is a name lost in the culinary mists of time, at least as far as popular kitchen culture goes. But in the 1920s and 1930s this dapper, energetic Frenchman ran one of London’s swankest restaurants. At Boulestin’s, which opened in Leicester Square in 1925, moved to Covent Garden a year later, and closed in 1994—it was replaced by a Pizza Hut—the décor was colourful (he once worked as an interior decorator and was greatly influenced by Paul Poiret’s Atelier Martine), the clientele posh (Lady Diana Cooper was a fan), and the menu a tasty mixture of French standards and English country. In any case as I was lazily sipping a cup of tea Saturday morning my husband announced he and our daughter were going to the grocer and that I’d better make a list. So I broke out several cookery books for guidance, including Boulestin’s A Second Helping (Frederick A. Stokes Company, 1925). 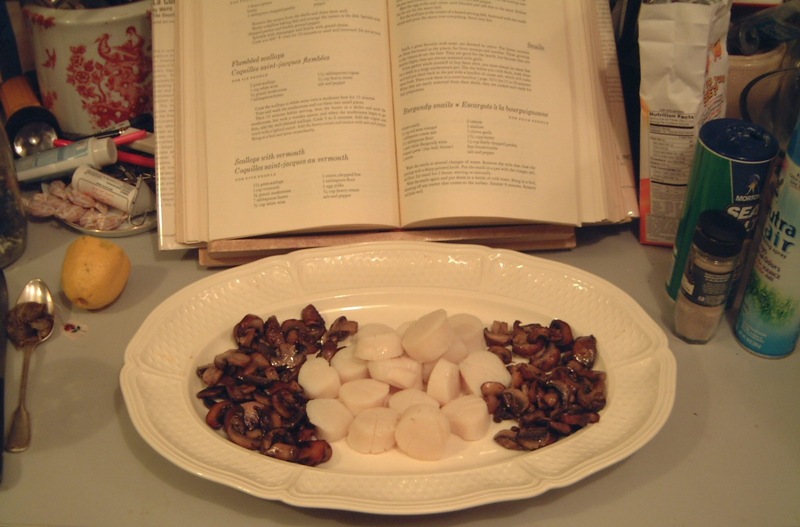 From its pages I decided we would dine that evening on foie de veau or liver. Our daughter, Catherine, loved her first dish by Boulestin, saying it tasted like cheese; when pressed, she explained she meant the texture. Then I slipped up and used the L word, at which point she screwed up her face and downed a glass of water to rinse the taste out of her mouth. Ah, well. It’s often safer just to describe liver and other such viands to her in general terms as “meat.” That four-letter word is vague enough not to disturb a child’s delicate sensibilities. Toss the bacon, parsley, and shallot together in a bowl. Season with salt and pepper. Sprinkle this mixture evenly in an ovenproof dish (approximately 10 x 10) and set aside. 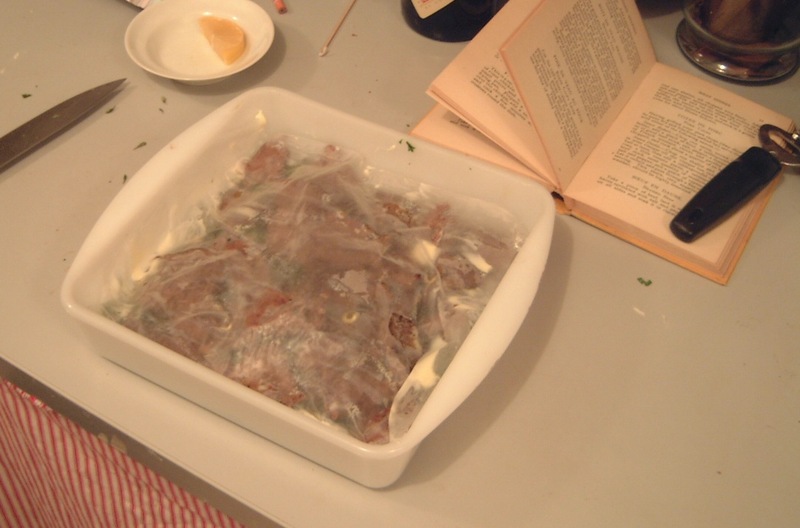 Covered with a buttered sheet of parchment paper, the foie de veau is ready to place in the oven. Place the browned liver in the ovenproof dish on the bacon, parsley, and shallot mixture, and pour over it the butter in which it was cooked. Cut a piece of parchment paper just large enough to cover the liver completely and butter one side of it; lay it on top of the liver, butter side down. 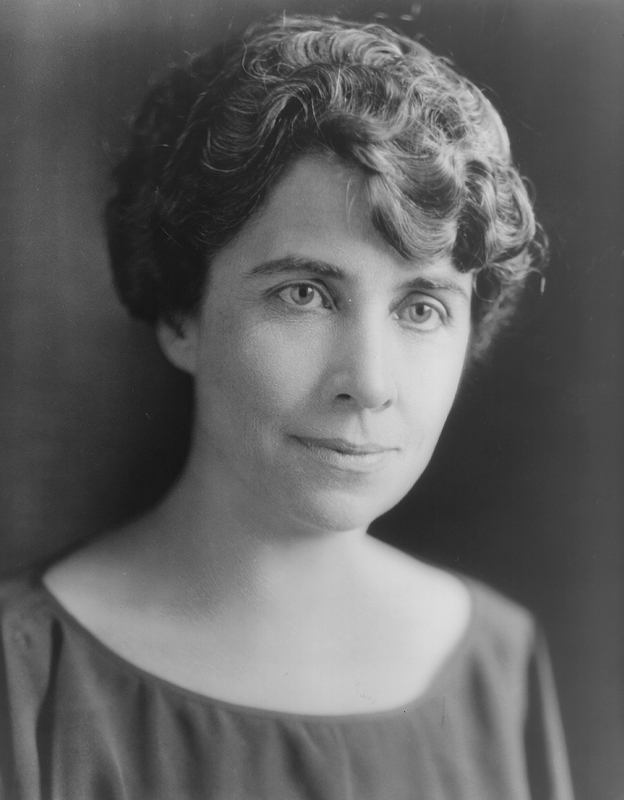 Grace Coolidge, First Lady of the United States, in 1924, the year she donated a recipe to the Richmond Day Nursery Association's cookery book. Not long ago my mother-in-law showed me a book of recipes published in 1924. It had been printed to benefit the Richmond Day Nursery, a school in Richmond, Indiana, where both sides of my husband’s family have lived for generations. 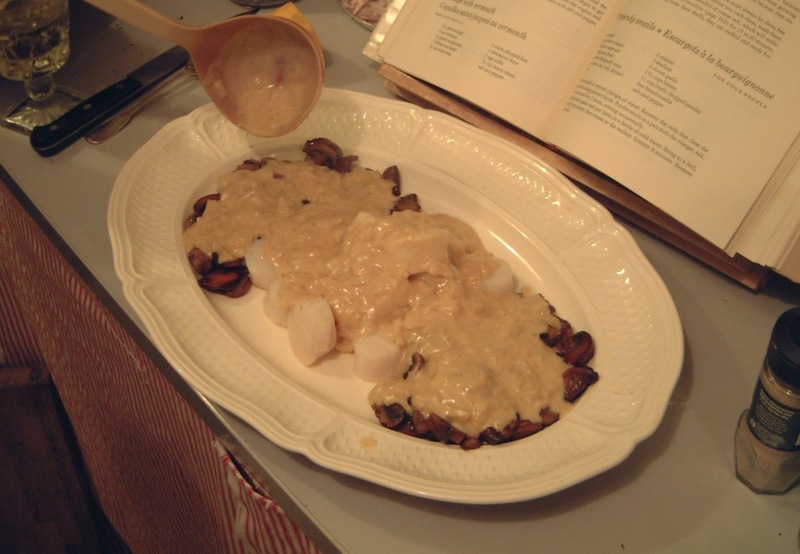 The book belonged to his great-grandmother Muriel Bartel Rohe, and the yellowing pages are filled with favourite dishes of the local gentry, including several submitted by great-grand-aunts and distant cousins. The organizers of the cookery book also reached out to First Lady Grace Coolidge. Mrs. Coolidge—famously painted that same year by Howard Chandler Christy in peerless red velvet, her favourite colour, with the family’s white collie Rob Roy at her feet—graciously complied with a dessert called Coffee Soufflé. 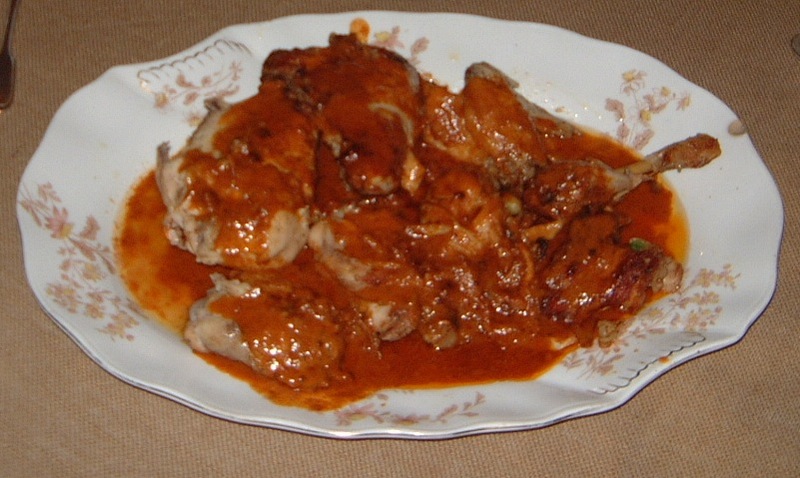 Its origin is unknown, though it may have come courtesy of Elizabeth Jaffray, the Coolidges’ housekeeper. Grace Coolidge was a witty, stylish woman who loved dancing, was a big baseball fan, and taught deaf children in her youth, but the First Lady considered herself hopeless in the kitchen. Grace Coolidge and her collie Rob Roy, as painted in 1924 by Howard Chandler Christy. Of course I was intrigued. Coffee and soufflé are two words that quicken my heart, and I’ve always had a fascination with Mrs. Coolidge, largely because of the glamour of the Christy painting, arguably the most elegant First Lady portrait to hang on the walls of the White House. So I tried the dessert out on friends with whom we dine nearly every week-end, and though we all agreed Mrs. Coolidge’s dessert is more a mousse than a soufflé, they pronounced it delicious. I, however, was somewhat disappointed in the result. It just seemed a bit too spongy for me, due to the gelatin required. The coffee flavour was subtle, though, and pleasing, and we provided some contrast to the coffee and whipped cream by sprinkling it with shavings of dark chocolate. 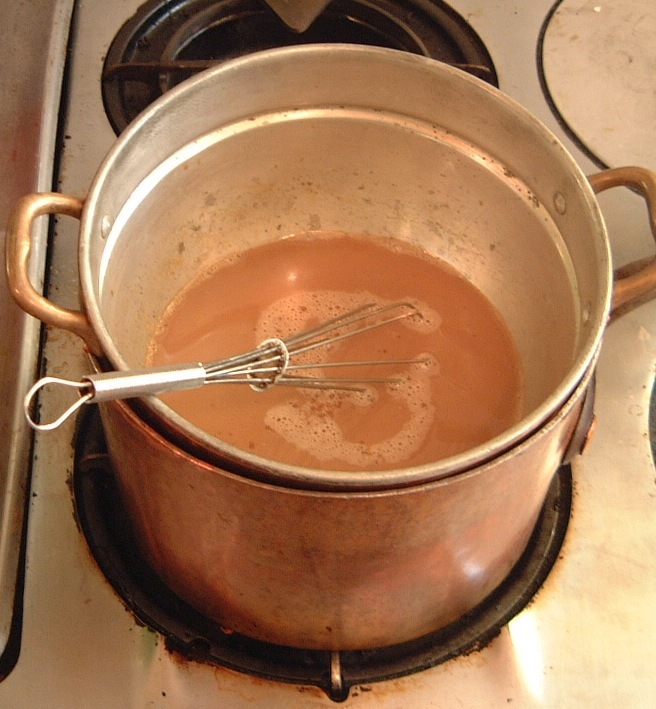 Heat the coffee, milk, gelatin, and 1/3 cup of the sugar in a double boiler. The first four ingredients being heated, as directed. We don't own a double boiler so I simply nestled a fondue pot inside a copper sauce pan. Add the egg yolks, which have been slightly beaten, the salt, and the remaining 1/3 cup of sugar. Cook until the mixture thickens, stirring frequently; this will take some time, and it will eventually have the consistency of motor oil (it’s the only way I can describe the texture). The whipped egg whites as folded into the coffee mixture. 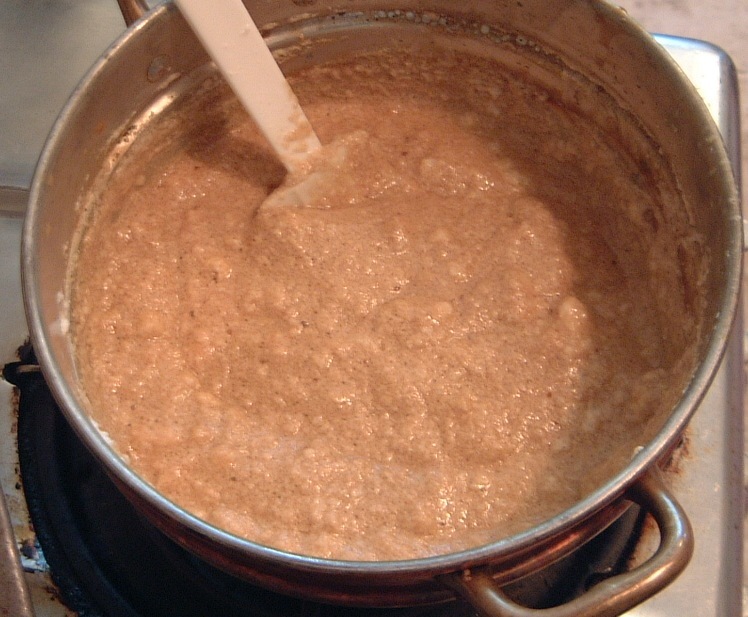 Remove the coffee mixture from the heat. Beat the egg whites and the vanilla until stiff. Gently fold the whites into the coffee mixture. When thoroughly combined, pour into a mold, chill until firm, serve with whipped cream, and garnish with dark-chocolate shavings (see below). An individual serving of Grace Coolidge's Coffee Soufflé, plated in a vintage Johnston Brothers bowl. It really needed a sprig of mint to brighten it up, but we hadn't any in the house. 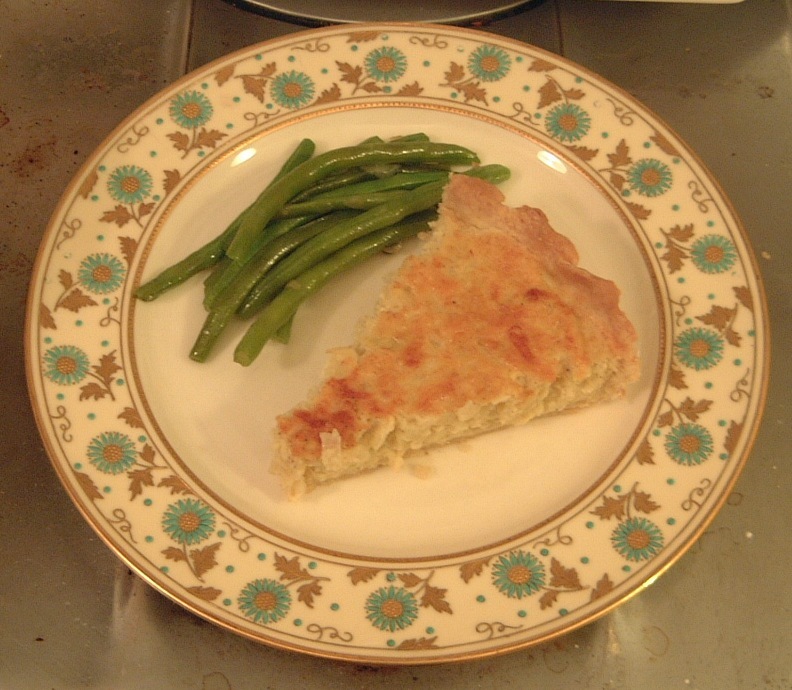 Cheese-and-onion tart and green beans on a circa-1880 English china dinner plate. Who can resist cheese (the lactose-intolerant among you excluded, of course)? Every member of our family practically drools at the mention of cheese, whether it’s an undistinguished Cheddar intended for a grilled-cheese sandwich or a particularly ripe Époisses de Bourgogne, of which I have a very fond, very pungent memory from a long-ago tour of Burgundy. That includes the elder of our two dogs, Daisy, an elderly chow chow who spends her days in a largely catatonic state until she detects the aroma of Brie, for instance, or Emmenthaler. 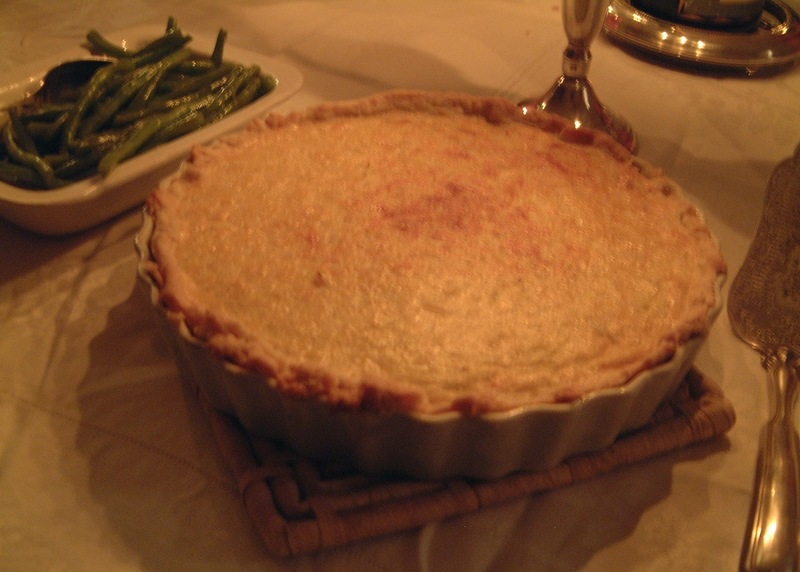 With this family passion in mind, my industrious spouse decided last night to make Mapie de Toulouse-Lautrec’s tarte aux oignons et fromage (that’s cheese-and-onion tart, fyi). Its spiritual warmth and elemental earthiness bore witness to the basic beauties of farmhouse cuisine, the luxury of sautéed onions suspended in a creamy golden matrix of baked eggs and Gruyère cheese. A glass of white wine plus a side dish of green beans cooked in butter with a dash of sea salt made it a worthy end-of-day repast. Peel and chop the onions very fine. Cook in boiling salted water for 15 minutes. Strain completely and sauté in the butter until golden. 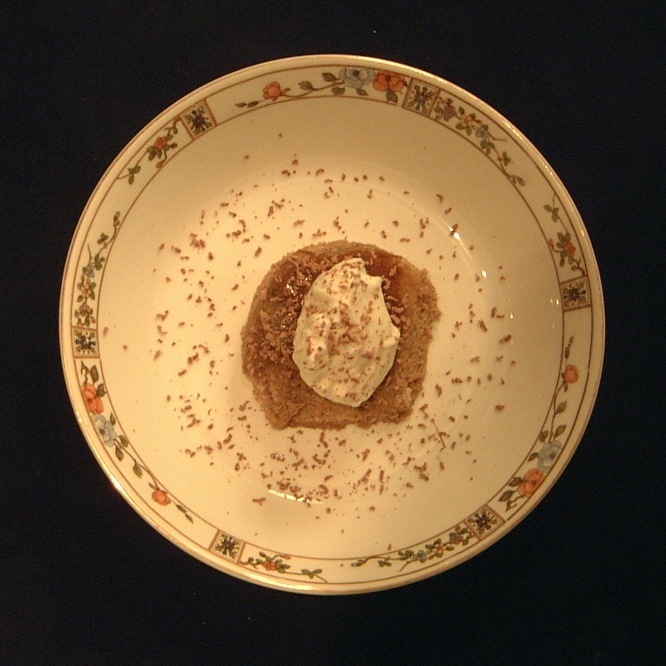 Beat the eggs in a bowl with a fork and add the flour and the cream, beating continuously. Beat in the grated cheese and season with pepper. Do not add salt before tasting because the cheese may be salty enough. Finally stir in the onions. 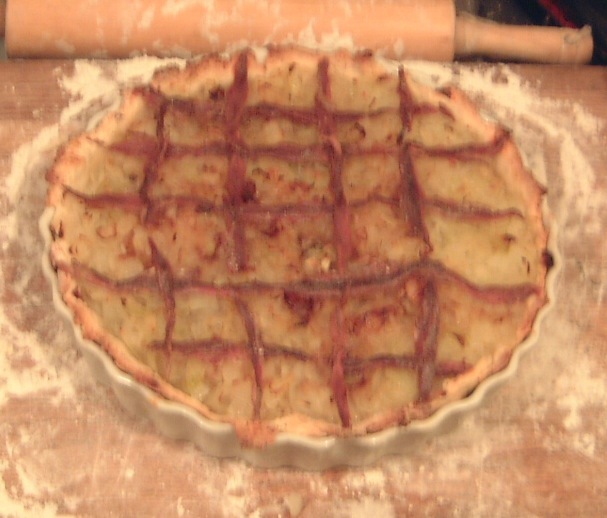 Fill the tart with the mixture and bake 30 minutes until golden. Let cool for 10 minutes then serve.